Defeat is supposed to make a fighter stronger. The gaping holes in their game become illuminated and an inflated ego is dimmed, paving the way for growth and development. Quite simply, if you don’t lose, you don’t grow. It’s a necessary evil. Conor McGregor probably best understood that wisdom and laid down the blueprint for dealing with defeat after he lost to Nate Diaz in March. No excuses, no hiding and no bitterness. The Irishman channelled his disappointment into the ravenous pursuit of self-improvement and returned a better mixed martial artist for it. 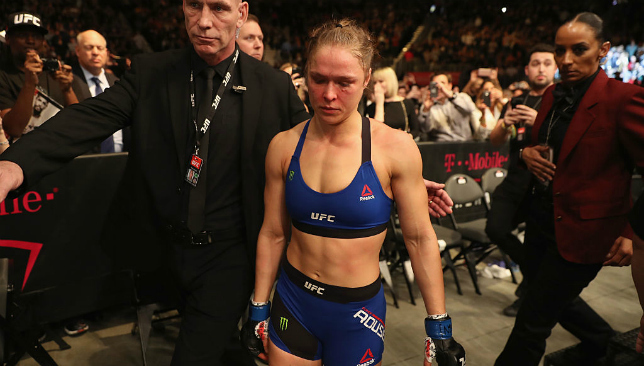 But for Ronda Rousey, defeat made her worse. In all aspects. When the former UFC bantamweight queenpin was viciously and decisively dismantled by Holly Holm at UFC 193 in November 2015, it broke her. A seemingly impenetrable mental fortitude was reduced to rubble and she has been left trying to pick up the pieces ever since. She disappeared from the public view in that bid, but when she did resurface, it was clear her first MMA loss was a spectre which continued to haunt the corridors of her mind. In an interview with Ellen DeGeneres she revealed suicide had entered her thoughts and told UFC president Dana White she felt betrayed by the media. 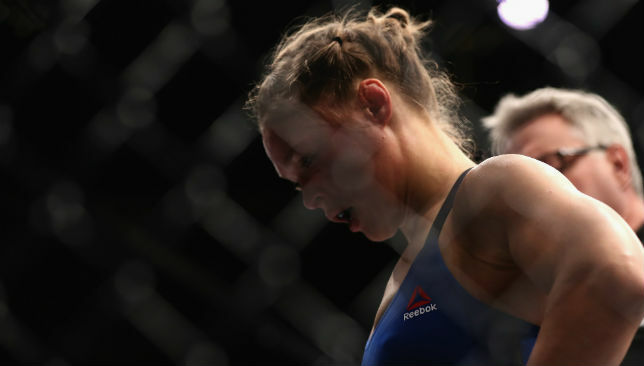 But eventually Rousey felt she had rebuilt herself sufficiently sturdy enough to step back into the Octagon. Physically that was true because she looked better than ever. Yet when Nunes delivered that first stinging right-hand in virtually the first exchange in anger, she stood stunned. Like she’d seen a ghost. Her body language changed and immediately she was paralysed by the shuddering reminder of the defeat to Holm and from that point on, Nunes dispatched her in cold-blooded fashion. In the year away from the cage, Rousey evolved nothing. She somehow looked worse. The same defects from the Holm fight returned as she stood flat-footed and didn’t take her head off the centre line. Not once. She moved her head, but only after being hit. It’s basic boxing fundamentals and she is devoid of them. What brought her so much success was her Olympic medal background in Judo. Rousey was like a shark, thrashing her foes around the cage with incredible strength and athleticism. But for whatever absurd reason she’s been convinced that she is a boxer by her team led by head coach Edmond Tarverdyan and has drowned in unfamiliar water ever since. Nunes did not do anything particularly special. It was simple one-two punch combinations packed with power and the knowledge that what would come back could be slipped with relative ease. Rousey just didn’t even look like she belonged in there, a sentiment made all the more difficult to comprehend considering she is the reason women like Nunes are even able to flourish in the UFC. Yet, talk of retirement may be premature. Media commentators will say she has options. But is that necessarily true? No doubt she has money in the bank having pocketed a flat $3 million plus a slice of pay-per-view pie for her 48 seconds of action. The idea of Hollywood providing the type of monetary support equal to what prizefighting can bring her, though, seems far-fetched. Rousey’s movie persona was built on the dominance with which she went about her day job, and that has been unquestionably eroded. It’s much harder to cast Rousey without that perception, as cruel and cut-throat as that may read. There may not be much choice for her other than MMA and that shouldn’t be viewed negatively either. At just 29 Rousey is entering her athletic prime and if she can be convinced to leave her current training camp behind, significant improvements will be made elsewhere. Perhaps then it will be the defeat to Nunes which will lead to crucial lessons being learned and an improved Ronda Rousey can emerge. Given she vanished from the T-Mobile Arena without uttering a single word, though, it seems she may just disappear for good this time.